American rabbi and scholar; born in Shillelen, province of Kovno, Russia, March 31, 1850. He was educated at the rabbinical college, Wilna, at the rabbinic school, Berlin, and at Maimonides' College, Philadelphia, Pa. (1873). In 1883 he received the honorary degree of doctor of law from the University of North Carolina. 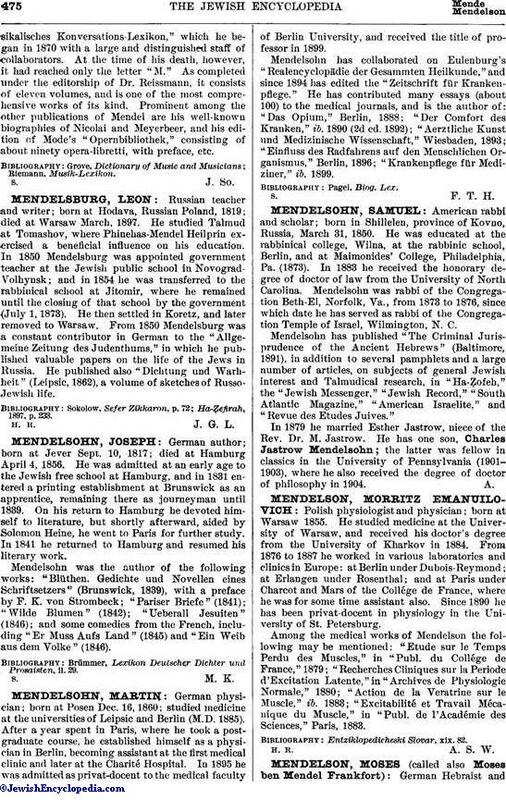 Mendelsohn was rabbi of the Congregation Beth-El, Norfolk, Va., from 1873 to 1876, since which date he has served as rabbi of the Congregation Temple of Israel, Wilmington, N. C.
Mendelsohn has published "The Criminal Jurisprudence of the Ancient Hebrews" (Baltimore, 1891), in addition to several pamphlets and a large number of articles, on subjects of general Jewish interest and Talmudical research, in "Ha-Ẓofeh," the "Jewish Messenger," "Jewish Record," "South Atlantic Magazine," "American Israelite," and "Revue des Etudes Juives." In 1879 he married Esther Jastrow, niece of the Rev. Dr. M. Jastrow. He has one son, Charles Jastrow Mendelsohn; the latter was fellow in classics in the University of Pennsylvania (1901-1903), where he also received the degree of doctor of philosophy in 1904.